For Easter 2015 I was challenged by The Works to use some of their products to create an amazing Easter bonnet and inspire entries into their Easter Bonnet Competition. We had never actually made an Easter bonnet before so it was a really fun challenge for us, and luckily we received a lovely hamper full of crafty goodies from The Works to help us. Our starting point was this basic Easter hat, which cost just £1. And below is our finished Easter bonnet - an Easter chick Spring picnic hat! Harry, Mia and I worked on it together and we are so proud of it! 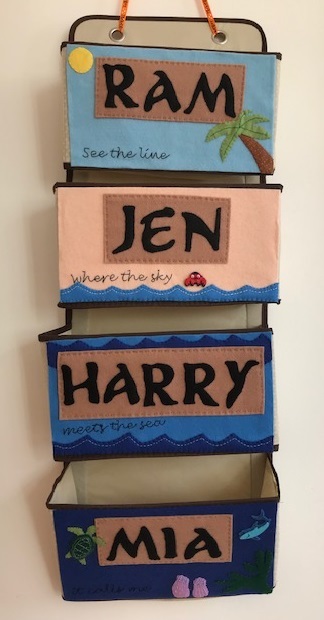 The Works has loads of Easter crafting products in store, and you can see a selection of the products from this year below. With quite a lot of fluffy yellow Easter chicks in our hamper we came up with the idea of a Spring picnic for them. 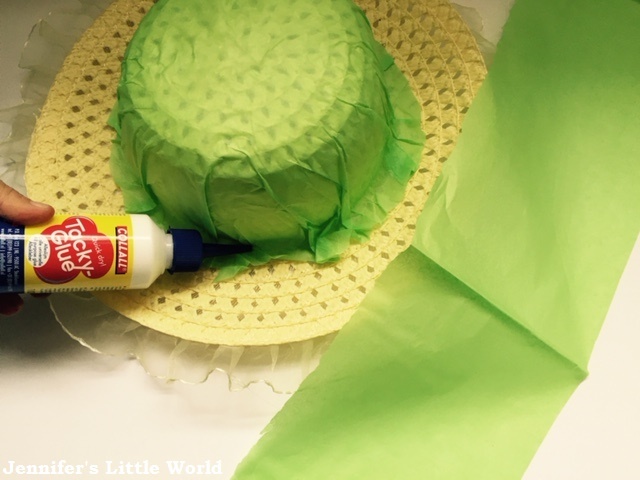 Our first step was to cover the entire hat in green tissue paper so that it would look like a grassy green hill. I removed the ribbon from the hat, and first cut a large square of tissue paper. 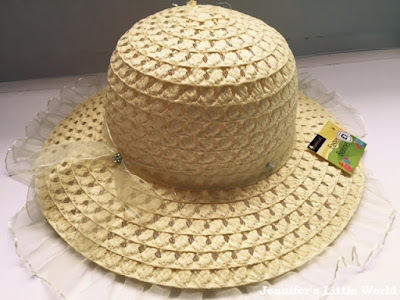 I used long strips of double sided tape to cover the bowl of the hat, and then we smoothed down the tissue paper before trimming neatly around the edges. To cover around the brim I cut two long lengths of tissue paper about 10cm wide. I squeezed out a thick line of white PVA glue around the base of the bowl on top of the tissue paper and then we stuck the strips around the brim of the hat. I used lots of glue and we all pressed it down firmly before leaving it to dry. Then I folded the edges of the tissue paper underneath the brim and again used the PVA glue to stick it firmly. We used a wide strip of Easter egg paper ribbon from the Easter Bonnet Decorating Kit to make a hat band. While the hat was drying Harry made a cheerful gingham style tablecloth from a piece of white paper and red pen, and we made the cake for the top of the hat. To make the cake we used the end of a cardboard tube that had contained sweets. Harry tore up squares of tissue paper to make balls and glued them over the entire tube, with a red one on top for a cherry. We added some pretty Easter ribbon around the sides. Then we glued it on top of the table cloth. We finished off the decoration of the Easter bonnet with some larger yellow chicks enjoying the cake, and plenty of smaller chicks having fun around the brim of the hat. Finally we used some pretty decorative artificial flowers. I pulled them apart so that we could use the flower heads at the base of the brim, and we tucked the long leaves into the hat band so that they looked like grass growing up around the picnic spot. Here is Harry proudly wearing his creation. We had such fun making this bonnet together, I think that a yearly Easter bonnet is definitely going to become a family tradition! I'm linking this post up with Tuesday Tutorials. If you are looking for more Easter Chick crafts you might like this post - Easter Chick crafts and activities. I received a hamper of craft supplies from The Works in exchange for this post. A great Easter Bonnet - looks amazing! Thank you very much, we were rather proud of it!